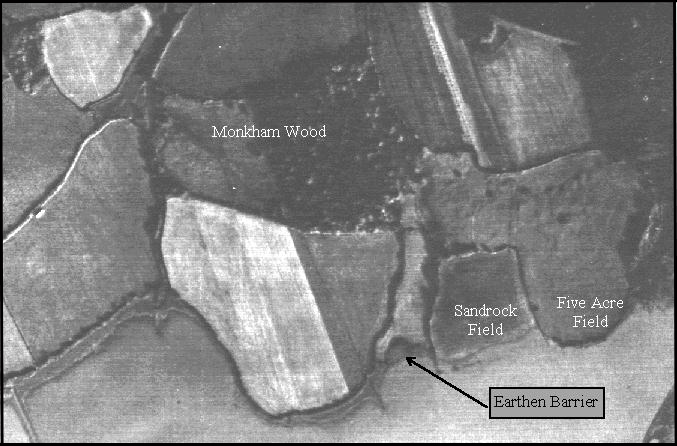 This photograph shows a much larger area of the landing site to the east of Sandrock field and south of Monkham Wood. This was taken in November 1960 in the very early morning, when the mist was still lying on the valley floor. The field contours are more pronounced in Five Acre Field to the right, where the Saxon defence was situated. Immediately to the north of this, in the field shown top right, a light grey streak reveals yet another Roman track, which has not shown on previous photographs. See plan in part 33. In the centre of the picture is a field where half has been ploughed, hence the colour difference. Within this field there are a number of circles, which are more apparent on later prints. This field and the one to the left has a series of circular marks indicating an early settlement all along the north shore of the valley. Off centre of this photograph can be seen the Monkham inlet. Due to the earthen barrier, which we shall discuss later, the low level of the sun has accentuated the damming effect by keeping the mist out of the inlet and producing a shadow across the bottom. This effect is produced solely by the different level of the marsh and is not visible without a close inspection, yet appears quite apparent from this photograph.